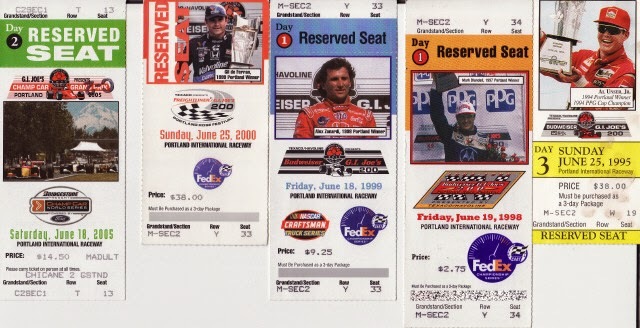 Portland International Raceway held a yearly IndyCar race on its premises each and every Father's Day. With the likes of Mikey', Mario, 'lil Al (Unser Jr.) 'Hollywood, (Danny Sullivan) "EMMO," (Emerson Fittipaldi) 'Shorty (Cristiano da Matta) Gil de Ferran and Mark Blundell taking the chequered flag. But since Portland was a fixture upon the Championship Auto Racing Teams (CART) way before 'lil Napoleon, aka 'TG (Tony George) began his rival Indy Racing League, that even when the IRL tried luring Portland into a three-year contract, the furor over Portland defecting to the "Dark Side" was so strong, that Portland chose to remain with the faltering Champ Car series instead! As this year's Father's Day marks the seventh year since any Indy Cars have raced in anger at Portland. Ode to Portland:Can it already be 5-Years GONE? While Portland actually celebrated its Open Wheel Racing Centennial prior to some 'lil place called the Brickyard. And while I'm happy for Milwaukee's resurrection, unfortunately it kind of reminds me of the previous scrap over the Sacramento Kings potentially being relocated to Seattle, since ideally both cities should have an NBA Franchise, just like Portland and Milwaukee should both have IndyCar races, and thus, in case Y'all cannot figure out my feelings over the matter then perhaps the following will help? Hey IndyCar, I think Portland's still Available!